As much we know from its name, a smartwatch can do much more than just a conventional watch, but they aren’t the smartest watch as of now. Smartwatches still aren’t popular like the current smartphones and it’s still emerging in the tech industry. And with a new tech, the pricing could seem a little higher than usual. 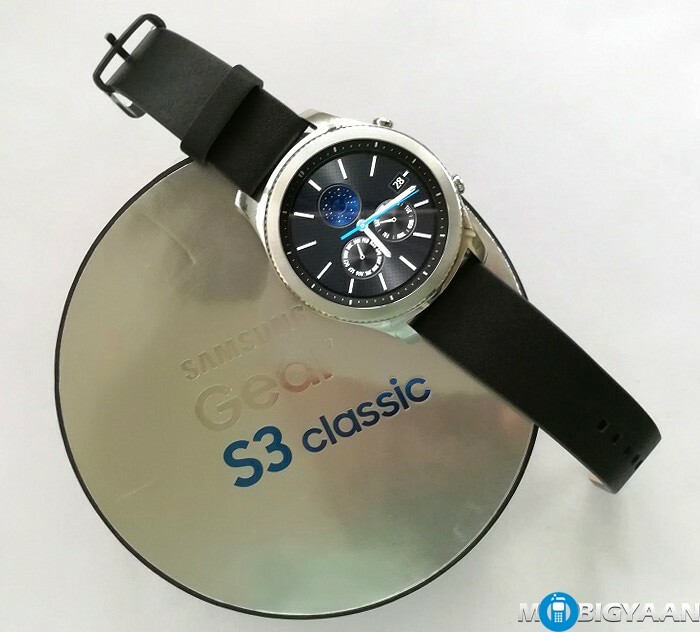 Since Android Gears like Moto 360 and LG G Watch R is already in the competition, let us see if Samsung Gear S3 has potential to dominate its competitors. Here’s our full Samsung Gear S3 review. The frontier looks are aggressive and build is robust. Made from brushed stainless steel with a dazzling round rotating bezel which maintains the classic appearance. 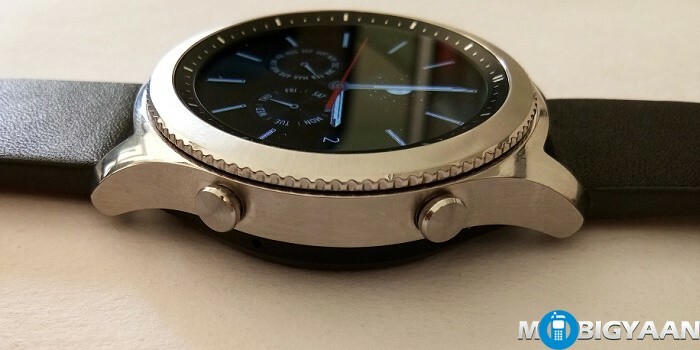 On the other hand, its weight and thickness are just about a large and thick watch, probably, suited for males. The classic variant has interchangeable leather straps with one small size (110 mm) strap bundled. Its frontier variant uses a strong rubberized waterproof belt instead. Unlike most watches, this one seems to add a little weight which is negligible, but since, it is a smartwatch with built-in battery, 57 grams weight is justified. The watch itself boasts a high-quality premium design redefined from its old generation devices. The only thing holding it back is it doesn’t come with IP68 ratings, hence, not water proof. 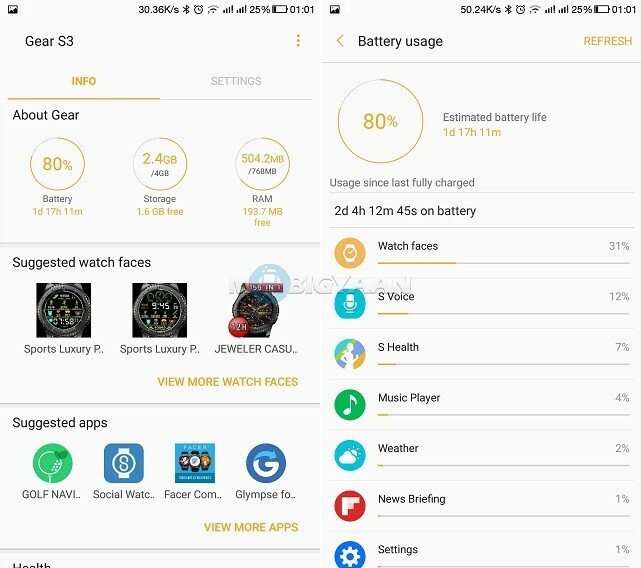 Gear S3 puts inside a small 380 mAh battery. This small 380 mAh battery lasts the smartwatch 2-3 days easily without charging. It uses a wireless charger that takes almost 3 hours to charge. The Samsung Gear S3 Classic and Frontier are essentially the same smartwatches with minor differences. If we talk about the Frontier version, the IP68 ratings make it dust proof and water resistant (1.5 meters deep for 30 minutes) giving an edge over the Apple Watch 2. The Gear S3 has two buttons on the right side. First is the back button and the other one is the Home key. The Home key opens the menu with all the apps the smartwatch offers. The same button can be pressed two times to trigger Samsung’s S-Voice which is basically a voice command control like Google Now but isn’t accurate like Google as well as Siri. There are no other buttons other than these two and the rotating bezel. 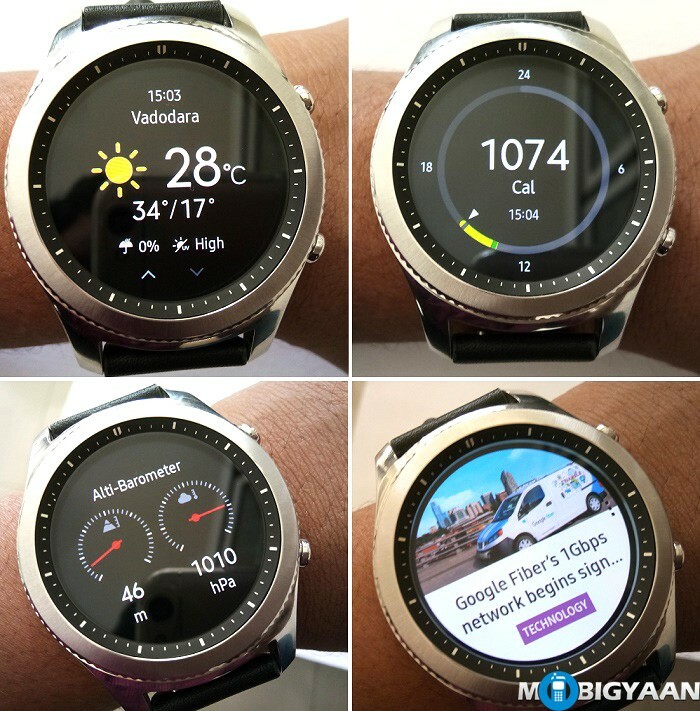 it features a 1.3-inch (33 mm) circular AMOLED display (360 x 360 pixels resolution) with AOD (Always On Display) feature. 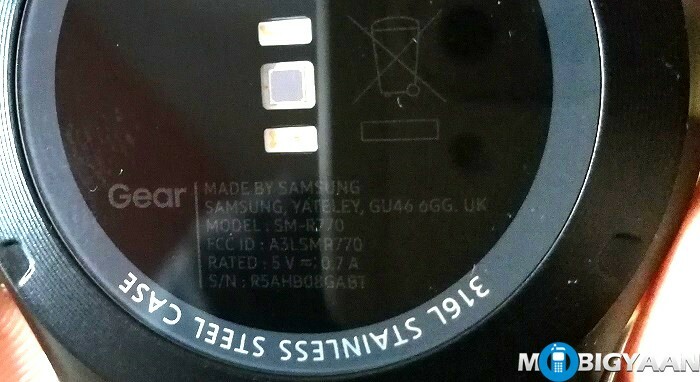 The Gear S3 is actually protected by scratch resistant Corning Gorilla Glass SR+. The concept of the Always On display came from the Samsung Galaxy S7 and S7 Edge smartphones. 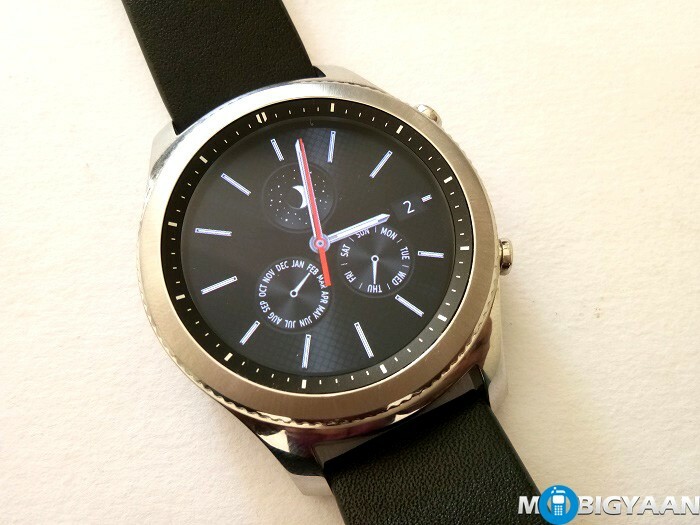 In sunlight, the watch face appears crisp and bright, the viewing angles are great. The quality of the display is the best you can get on a smartwatch. The Gear S3 Classic is fast, fluidic UI, no delays on window screens. 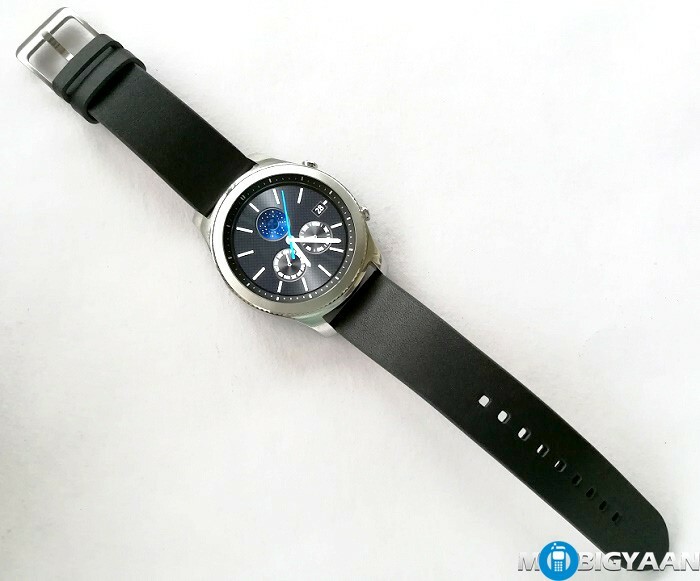 However, when activating the Samsung’s S Voice makes the smartwatch suffer. It sometimes does not respond at the S Voice correctly and lags the animations. It may sound that 768 MB RAM might be too little for the system. 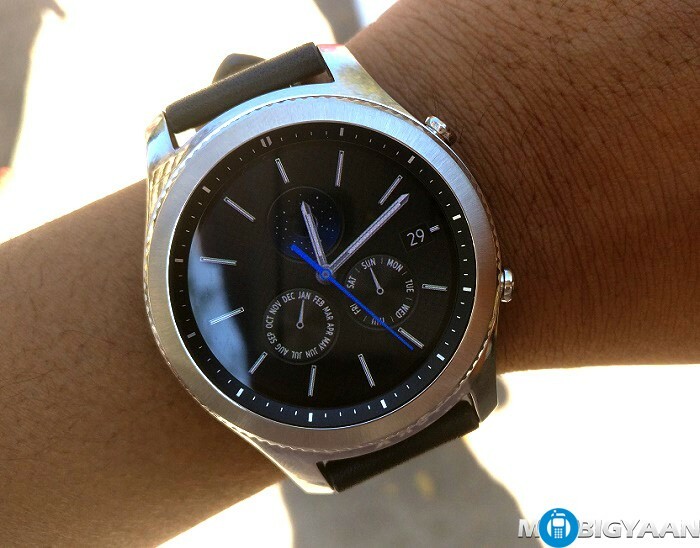 But, since it is a Tizen-based smartwatch, it doesn’t demand much hardware resources like the Android Wear. When we talk about the raw specs, it is powered by a 1 GHz dual-core Cortex-A35 from its home-grown Exynos 7270 14nm FinFET SoC. It comes with 768 MB RAM and 4 GB onboard out of which only 1.5 GB usable. The storage can be used to store music files. 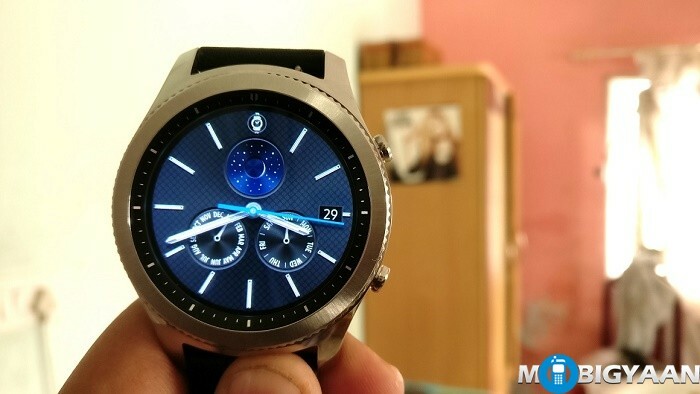 The Tizen-based smartwatch can do as much as just Android Wear does. 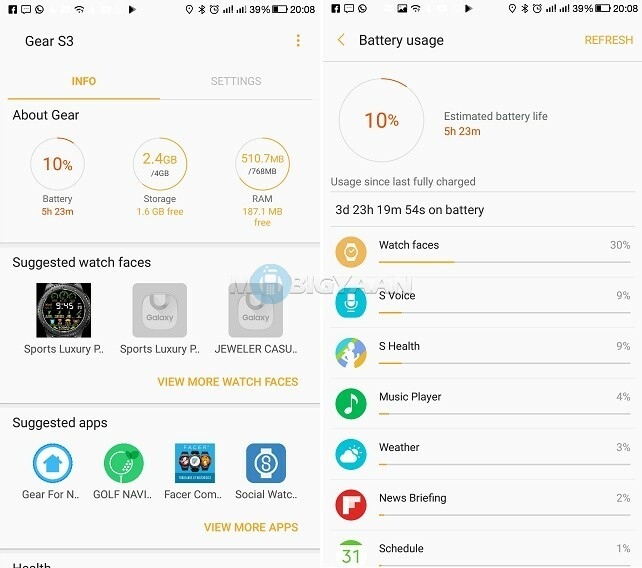 Samsung Gear S3 uses a customized Tizen operating system (ver. 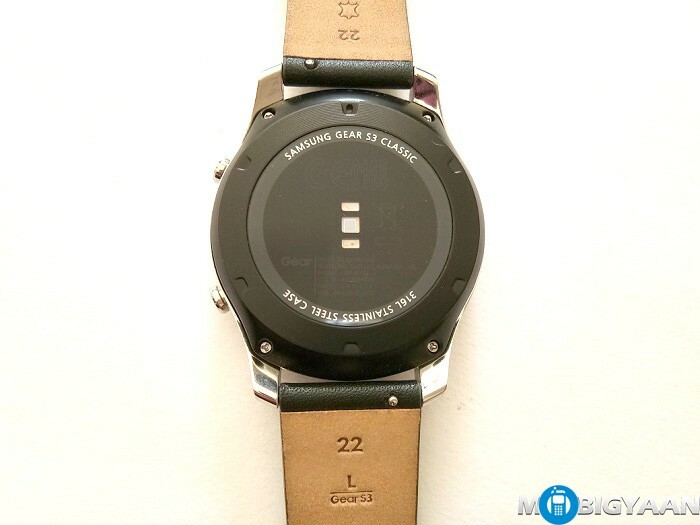 2.3.2.1) that functions particular to a smartwatch and I believe the only Samsung boasts Tizen-based smartwatches. 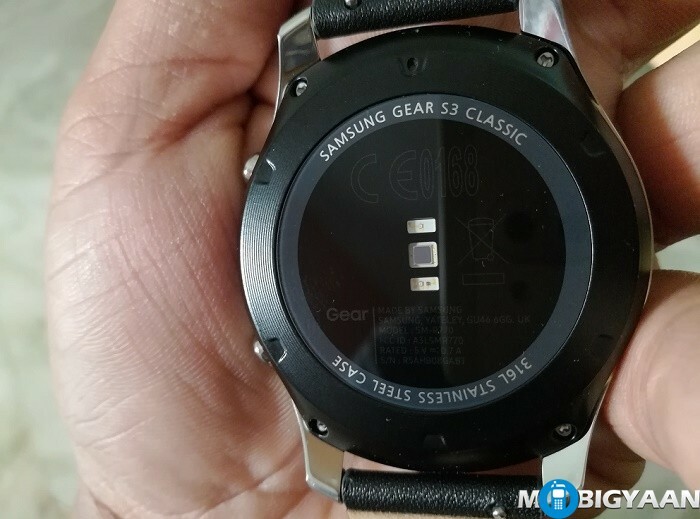 The watch continues to use the Tizen operating system which was also found on its previous generations and their Gear Fit series smart bands. 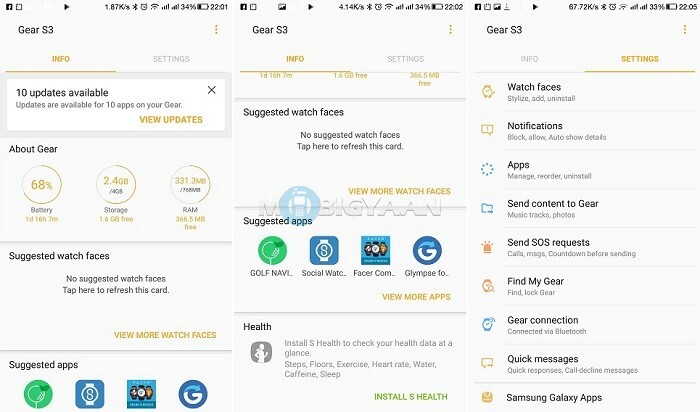 For the compatibility, the Gear S3 supports Android and iOS platform. 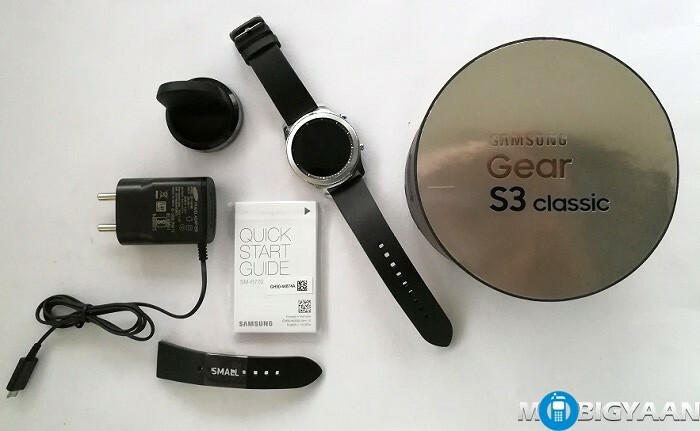 On the connectivity side, the Gear S3 has built-in Wi-Fi, GPS, Bluetooth, NFC as well as a microphone and a loudspeaker which can be used for voice calling right on the smartwatch. The smartwatch has an integrated GPS, heart rate monitor, ambient sensor, barometer, and accelerometer. It supports voice calls which can be dialed right from the watch. Since it is a Classic variant, it doesn’t offer SIM slot like the Frontier variant and uses your phone’s network to make calls. 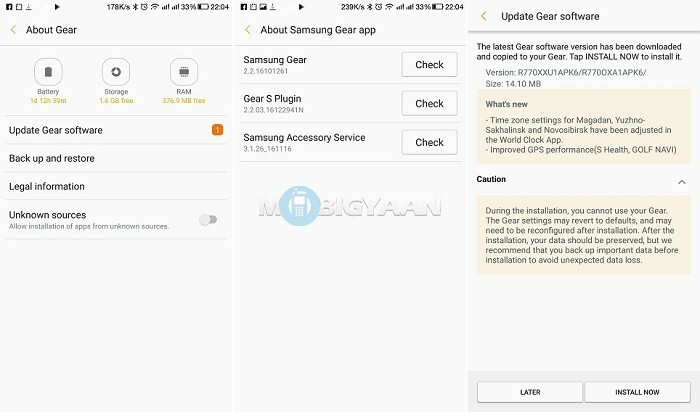 To pair with the phone you need to download Samsung Gear app and Samsung Gear S plugin app and connect using the Bluetooth. 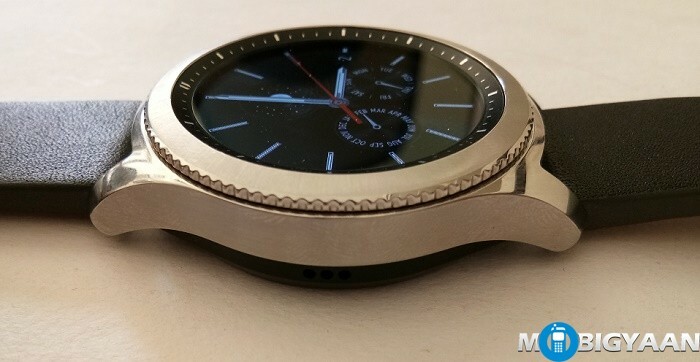 Once paired, you can interact with the watch with the Samsung Gear app. 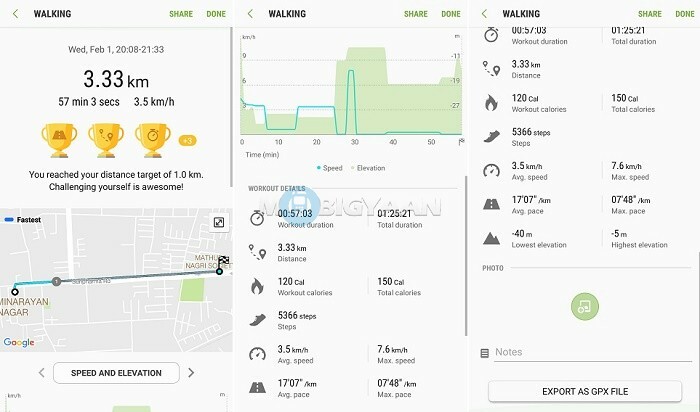 Furthermore, set alarm clocks, calendar entries, counts how many steps you made, calculate calories you’ve burnt and monitor your heart beats. Samsung Gear app has got a decent collection of watch faces, you can stylize your Gear S3 with many watch faces. 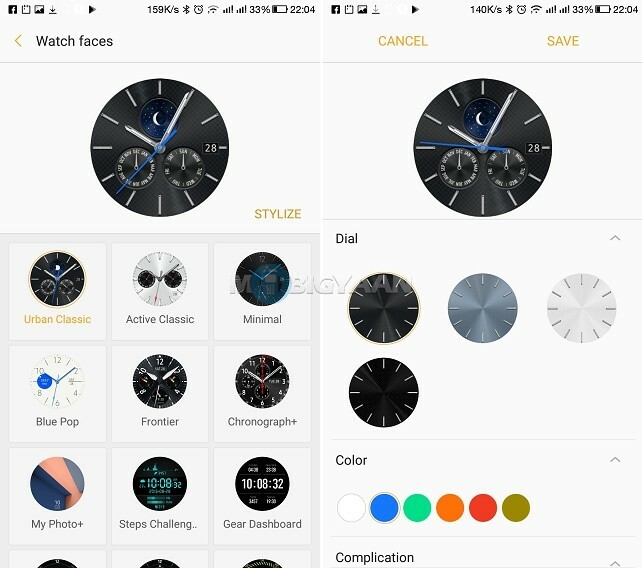 Customize the watch face design, colors, and stylize the watch face the way you want. 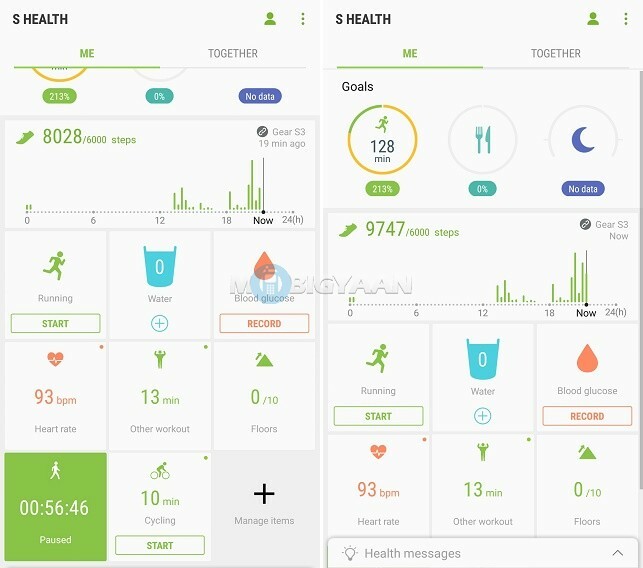 The watch is compatible with the Samsung’s S Health app, that means you can track all your fitness activities and other related tasks. This is the same app that Samsung’s flagship devices like Samsung Galaxy S7 come with. You can also record your step count activity using Pedometer. 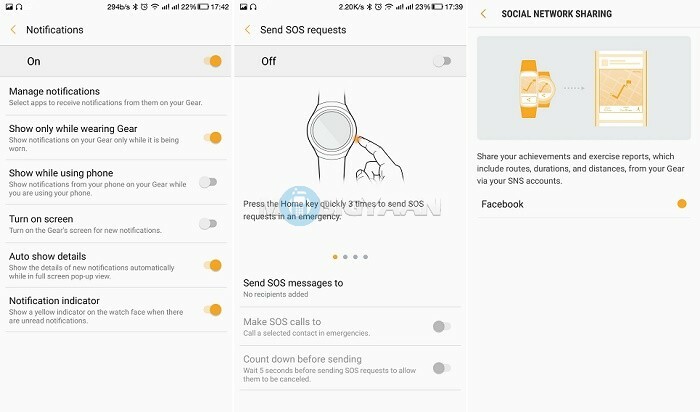 It also comes with SOS mode that can be activated by quickly pressing the Home key 3 times. The emergency contact will receive SOS message containing your location information and how to track you for up to 1 hour. After sending an SOS message, your emergency contacts can track your location for 1 hour. 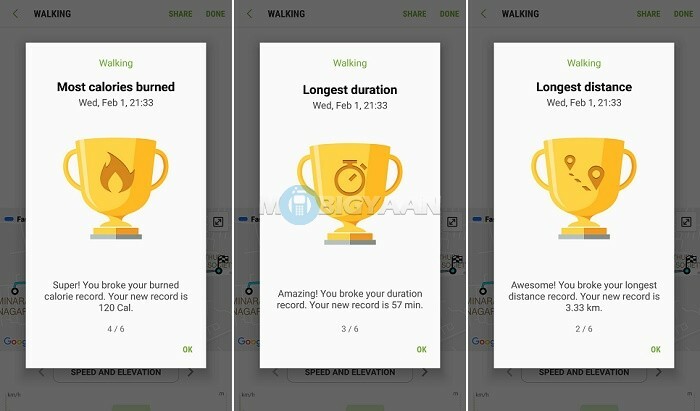 When you reach your fitness goals, you can share the goal achievements on social media accounts. 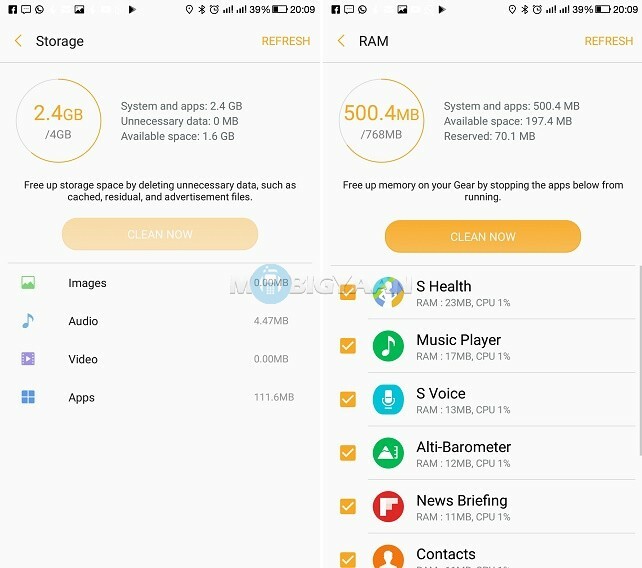 Samsung has enough room to store a 380 mAh battery. Samsung claims the battery life to run about 3-4 days. In our test, the battery was already running for more than 3 days without charging and in some cases when worn the Gear S3 for longer periods ran about 2 and a half days. However, the average battery life we got was 3 days which is close to what Samsung boasts. The Always-On watch faces can be turned off if you want to stretch the battery, I kept the watch face to automatic which only lights when you lift your hand to check the time or any notifications. The brightness was at 6 (half) and if you keep it full keeping the watch faces to always on, the battery life could be affected. The overall battery performance is very good for a smartwatch, big thanks to its super AMOLED display. It supports wireless charging dock which takes about 3 hours to charge the Gear S3 from 0% to 100%. The SamsunGear S3 can make you aware of the notifications, track your fitness activities, make calls, and still behaves like a professional classic watch with plenty of watch faces to customize. But it comes with a hefty price tag of ₹28,500. For people who want a complete smartwatch experience and can shell out such money, I would definitely recommend it. Otherwise, this isn’t the right time to put such an amount of money on a smartwatch.